If you are a website administrator, developer, or designer (or perhaps the three of them), you probably want to devote your time to those tasks instead of dealing with the web server, configuring and maintaining virtual hosts, or the like. Of course this is not because you don’t know how to work with Apache or Nginx – it’s simply because there are affordable hosting services that can manage that for you. On the other hand, if you are a system administrator in charge of deploying a cloud for your business or company (to name an example), you need to know what the most reliable VPS providers are out there. In this article we will review 7 web hosting / VPS providers for Linux and Windows, we are sure you will want to check out. 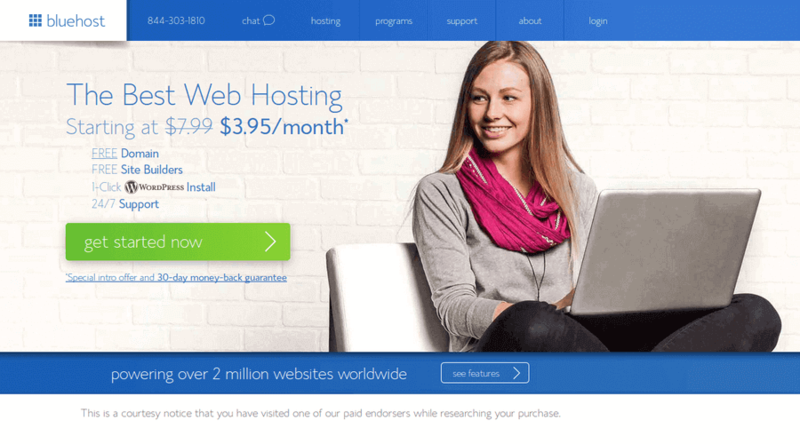 Since 2003, Bluehost’s mission is to make a better hosting company and to bring the Internet to more people than ever. One of the reasons of their success is the use of open source technology in their product and cloud-based solutions. Bluehost is based in Utah, USA, and has become since its origins one of the world’s largest providers of cloud-based online solutions. Bluehost offer a wide variety of products, ranging from cloud sites (starting at $6.95/month), shared hosting (starting at $3.95/month), WordPress hosting (starting at $19.99 during the first month, the blogger plan supports a whooping 100M visits/month! ), all the way to VPS hosting (starting at $14.99 during the first month, the basic plan includes a 2-core CPU, 2 GB of RAM, and a 30-GB SAN storage) and dedicated hosting (starting at $79.99 during the first month and currently offering a free upgrade on the number of CPU cores and storage limit). In addition, registrations of domains are offered for free with the purchase of at least 1-year hosting plan, or sold separately (starting at $11.99/year). Regular rates after the first month apply upon renewal. 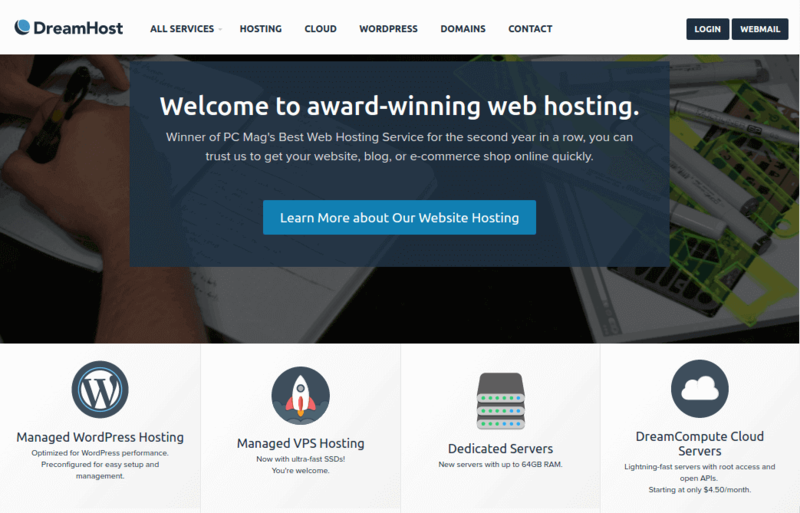 As the winner of PC Mag’s Best Web Hosting Service for two years in a row, Dreamhost takes pride in being able to get your website, blog, or e-commerce shop online in a snap. Their plans include web hosting services (+free domain included) starting at $7.95/month, managed WordPress hosting with SSD storage (starting at $16.95/month), VPS hosting (also with SSDs, starting at $15/month for 1 GB of RAM and 30 GB of disk space), dedicated servers (starting at $149/month for a 4-core CPU, 1 TB of disk space, and 4 GB of RAM), public cloud computing (compatible with millions of ready-to-go tools and applications starting at $4.50/month for their 512-MB RAM plan), and a generic object storage called DreamObjects to host backups, static data, or development work (starting at $0.025/GB of storage and $0.05/GB of downloads). 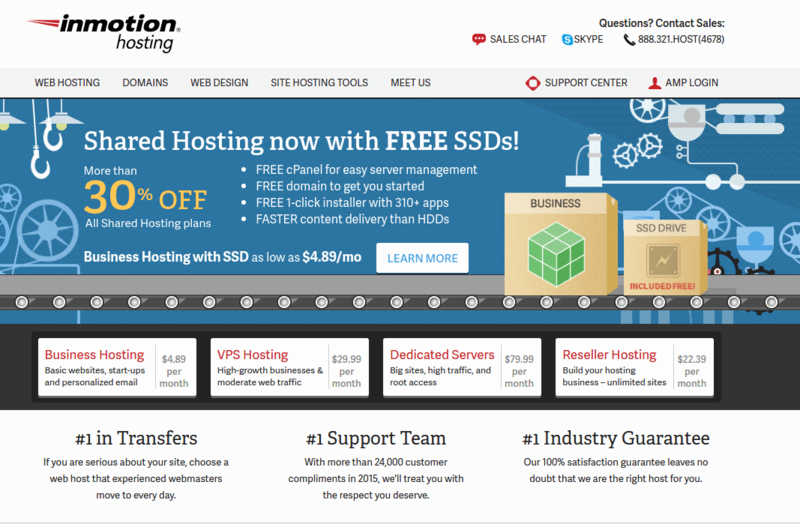 As one of the pioneers of web hosting, Inmotion has been around since 2001 and has served since then a large base of happy customers – “300K domains and counting” their website states. Their US-based support team is committed to make sure you succeed in your projects regardless of the time of day or day of year you need help. A vast knowledge base comprising more than 3K do-it-yourself articles and an active community can help you get started with setting up services and answer any questions you may have quickly. Their plans start at $4.89 for business hosting and go up to high performance dedicated servers for $229.99/month. Inmotion also offers website design starting with a free consultation with their experts. That hands down is certainly a plus. You should definitely check them out. Siteground, a web hosting company that combines great customer support, latest technologies, security, and good prices, should be definitely on your list as you consider prospective providers. 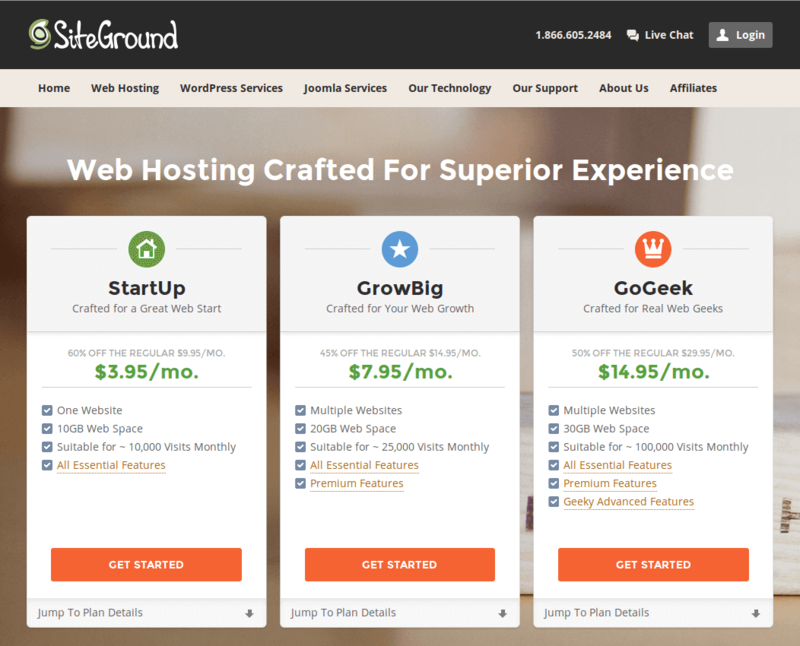 Siteground offers SSD-based shared web hosting solutions starting at $3.95/month for one web site and 10 GB of storage space, high performance cloud hosting starting at $60/month (including 1 3-GHz CPU with 2 GB of RAM plus 20 GB of disk space and a bandwidth limit of 5 TB), and dedicated hosting (fully managed machines) starting at $229/month (Intel Xeon E3-1230 3.20 GHz 4 core CPU / 4 GB DDR3 / 500 GB SATA II disk / 5 TB bandwidth). With datacenters in the United States, Europe, and Asia-Pacific areas, Siteground aims to bring you the best solution based in your location. 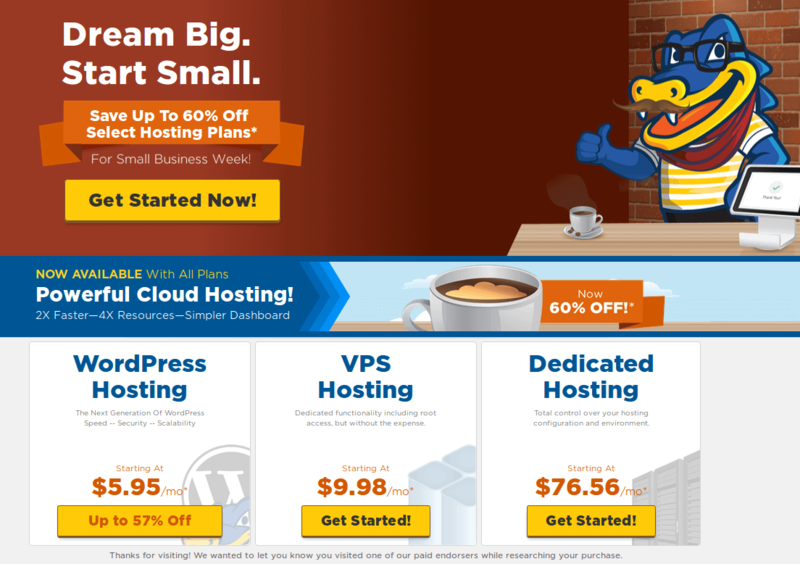 Who doesn’t love Hostgator’s mascot, the friendly geek alligator? But Hostgator has more to offer than a nice looking mascot. Besides the promises of 24/7/365 support and 45-day money back guarantee. Their starter plans include WordPress hosting (starting at $5.95/month during the first term), VPS hosting (starting at $9.98/month for half a CPU core, 512 of RAM, and 25 GB of storage space) and dedicated hosting (basic plan costs $76.56/month and features a 2-core CPU, 4 GB of RAM, 500 GB of disk space, and 10 TB bandwidth). 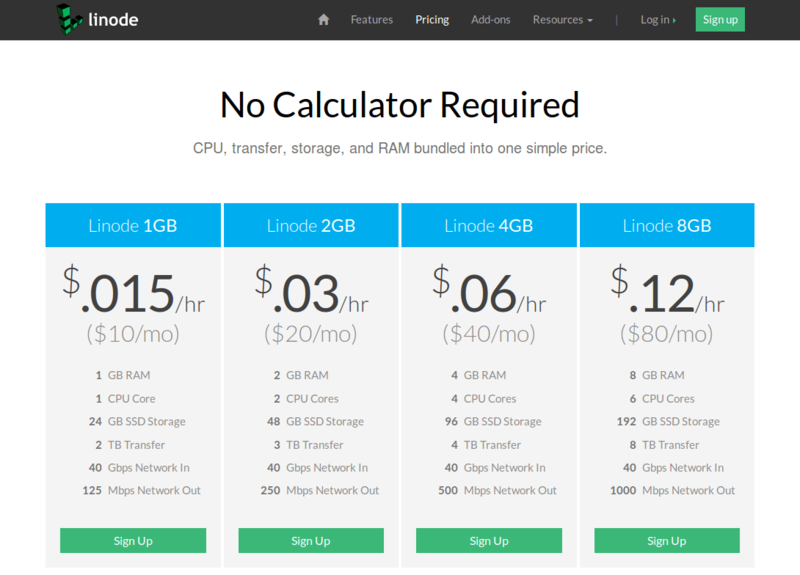 Advertised as “high performance SSD Linux servers for all of your infrastructure needs”, Linode is one of the most famous cloud hosting providers in the industry. The reasons behind that distinction are their 99.9% uptime guarantee, 24×7 customer support that replies to questions and tickets within a matter of minutes, the knowledge base that consists of hundreds of comprehensive guides about a wide variety of system administration and application development topics, and their amazing cost/feature rates for their robust services. Linode’s plans are named after the amount of RAM. The 1 GB plan (initial) also features 1 CPU core, 24 GB of storage space, and 2 TB of outbound data transfers for $10/month (inbound traffic does not count towards the bandwidth limit). From that point, you have 2 GB, 4 GB, and 8 GB plans for $20/month, $40/month, and $80/month, respectively. However, Linode does not bill per month but rather per hour, which means you are charged the hourly rate for a service up to its monthly limit. In other words, you only pay for what you use – no hidden fees or surprise charges. A relatively new kid on the block, Cloudways is a cloud platform (PaaS) founded in 2011 that makes deploying, monitoring, and managing high-performance applications on top of major cloud infrastructure providers (Digital Ocean and Amazon web services, to name two examples). They take pride in freeing customers from dealing with cloud infrastructure and hosting services so they can focus in their applications and businesses. Should issues arise, the support team is always ready to assist so that your web applications continue to operate flawlessly. The starter plan is $5.00/month and includes 1-core CPU, 1 TB of bandwidth, 512 MB of RAM, and 20 GB of storage. 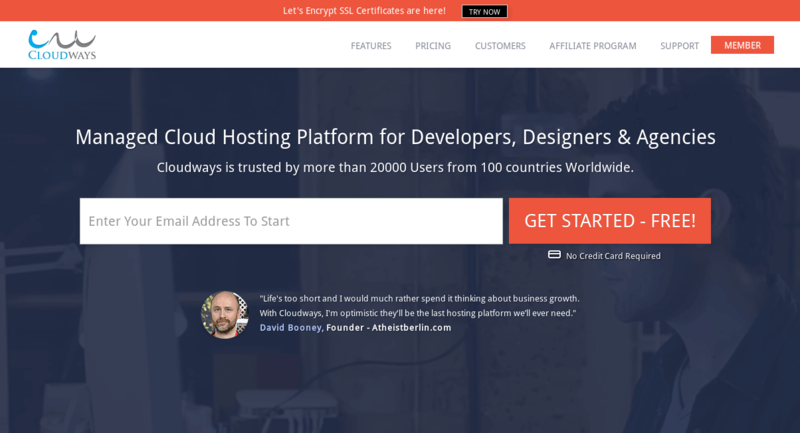 Another distinguishing feature is that Cloudways do not require a credit card to get started. In this guide we have reviewed 5 web and cloud hosting providers that you may want to consider to host your website, virtual private servers, or cloud infrastructure. We hope that you find this review useful to quickly determine what is the right service for you as per your needs and available budget. Now it’s time to cast your vote to decide the winner with the help of following poll. What’s The Best Hosting for Linux? If you have any questions don’t hesitate to let us know. In addition, if you know of other providers that you would like to recommend based on your experience with them, feel free to share the links to their websites and your review using the comment form below. Hi, I think Bullten Web Hosting Solutions is a very smart choice especially if you are new to website building or are a small entrepreneur looking to lunch a website. It is very easy on the costs and provides a better uptime than most other providers. I found rednecsys.net is missing there, its a very good hosting provider with great customer support and provides managed, affordable, secure, reliable and high performance sVPS, VPS Cloud, Instant Cloud and Dedicated Servers. Stay away from Linode. The’ll leave you out in the cold when *they* have issues. Short advance notice forced reboots several times on 2015, huge DDoS on Xmas left customers off the net. I manage a big SaaS site, I sailed to Google just because of them. How come Digital Ocean is not on this list? Maybe they were not providing a commission modified link, so they excluded like services. Pretty simple buddy.